Dior are celebrating 60 years of the iconic Rouge Dior lipstick and have revamped the formula, the packaging and even the shade line-up. The new, adventurous me (I’m trying to break away from neutral lip shades) went straight for 844, Trafalgar. It’s the most brilliant, brilliant red and I adore it because it feels very true and classic yet it leans towards the orange side of red rather than the bluer side. Though I love blue-reds for their ability to somehow make your teeth seem whiter, I love orange-reds even more for their vibrancy and boldness. They seem very modern and fresh – a little baby-step onwards from the bright coral that I feel comfortable wearing in the summer holidays. I feel more at-ease in this hotter red than I do the more ‘old Hollywood’ shades. It feels less formal, less dressed. Do you know what I mean, or am I spouting gibberish again? 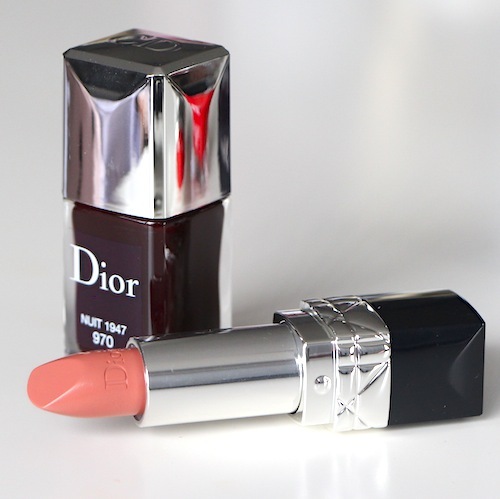 You can find all of the new Rouge Dior shades with free delivery at FeelUnique.com and at Dior counters nationwide. In terms of quality, wear and application, Dior’s Vernis polishes are probably my all-time favourite. The brush is wide, the formula is always the perfect consistency, the varnishes are quick to dry and slow to chip. 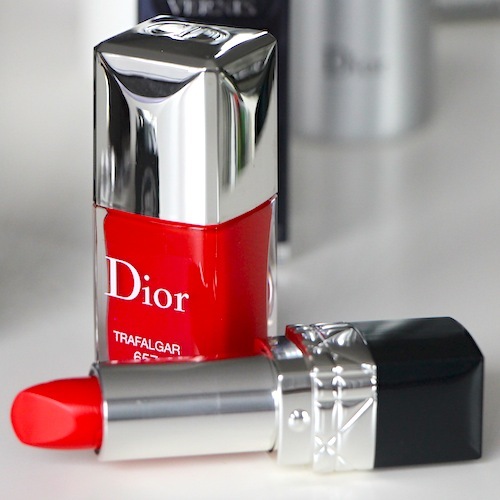 The Rouge Dior lipsticks are juicy and moisturising and don’t dry my lips out – colour needs to be reapplied throughout the day, but I enjoy this ritual so it’s no skin off my nose. There’s something quite spirit-lifting about a luxury lipstick application!